Grace-Marie Turner has been at the forefront of the health-care reform debate for years, as the founder of the Galen Institute, a Beltway-area public-policy institute dedicated to health-care policy. She has been an opponent of the Patient Protection and Affordable Care Act, in no small part having taken Catholic social thought into consideration. She has spoken at the Gregorian University in Rome and co-authored Why ObamaCare Is Wrong for America. Turner spoke with Kathryn Jean Lopez for the Register about why the Department of Health and Human Services’ coercive mandate is about the law itself — as the Supreme Court prepares to consider an attorneys general challenge to the law. The court will hear oral arguments the week of March 26, in cases challenging the individual mandate and the Medicaid expansion provision. What is your honest reaction to this “Where are the women?” argument in recent days? As I recall, you’ve been a pretty prominent opponent of the president’s health-care law itself, never mind the HHS mandate. Two women legislators walked out of a House hearing on Feb. 16 asking, “Where are the women?” and quickly commanded national attention for what was little more than a political stunt. Chairman Darrell Issa, R-Calif., had called a hearing entitled “Separation of Church and State: Has the Obama Administration Trampled on Freedom of Religion and Freedom of Conscience?” The first panel of his Oversight Committee hearing was comprised of distinguished scholars, including Bishop William Lori, chairman of the Committee for Religious Liberty at the bishops’ conference, and four other religious scholars of similar distinction — all men. The hearing clearly was called to explore the constitutional question of religious liberty. But Reps. Carolyn Maloney, D-N.Y., and Eleanor Holmes Norton, D-D.C., stormed out because a college student was not invited to join the panel to talk about a friend’s difficulties in getting contraceptives. Chairman Issa said that Sandra Fluke, a law student from Georgetown University, was rejected because she was “not found to be appropriate or qualified” to testify about religious liberty. News reports focused not on the substance of the hearing, but on the optics. The Democrats’ proposed witness was completely irrelevant to the panel; liberty, not contraception, was the topic. The reaction by the media and the Democrats was a base expression of gender politics. The fact that the second panel had two women as witnesses became irrelevant. Has this women’s health stuff gotten out of hand? This debate absolutely is getting out of hand, and people are confused by the complexity of what is really going on. The issue is not about women’s health. Walmart sells birth-control pills for just $9 a month. How on earth is that a crisis that deserves this kind of attention? I have to think that the White House knew exactly what it was doing when it mandated that virtually all employers, including Catholic and other religious institutions, would be forced to pay for free preventive services, including sterilization, contraceptives and drugs that cause abortion. The White House wanted to confuse women into thinking that Republicans want to ban contraceptives when that absolutely isn’t the case. Has this mandate stuff gotten out of hand? It is hard for me to believe that the administration anticipated the uproar that it has created. In addition to the forceful opposition of the Catholic bishops, more than 2,500 pastors and evangelical leaders have signed a letter to President Obama asking him to reverse the mandate. While most Protestants don’t oppose contraception, they do oppose the Obama administration’s requirement that religiously affiliated organizations are forced to provide and pay for services and products to which they have a strong religious objection. The letter calls the mandate a violation of religious freedom. This has become a serious and consequential constitutional question about the meaning of the First Amendment’s guarantee of religious liberty. 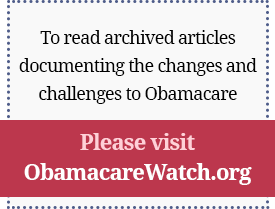 Is the mandate instructive about Obamacare itself? Yes — all of this is rooted in Obamacare. It is clear evidence that when the government takes over control of our health-care system it also takes control over our most private health-care decisions. The government has decided that all women should have free birth control and pay nothing if they want drugs that cause abortion or decide to have their tubes tied. The Catholic Church and many other religious organizations simply cannot comply with the administration’s mandate. So this truly is a “stand down.” The Constitution’s protection of religious liberty is unquestionably being violated by the Obama administration’s mandate, and it will either be resolved in court or at the ballot box — or both. Are we losing some sense of the dignity of the human person in all of this? Obamacare is quickly moving us toward a socialist model of health-care payment and delivery where government, not doctors and patients, make decisions about our lives. The 2,800 pages of legislation and 10,000 pages of rules that already have been issued display a massive violation of the concept of subsidiarity. To preserve our dignity as free individuals conceived in the image of God, we are called to love and care for one another and to make decisions that express our faith and dignity. That is impossible when decisions as basic as life and death are being made for us by the state based upon what it considers is best for the collective good. The dignity of the individual is crushed in such a system. The common good is achieved by a society in which individuals are responsible beings in a moral society that embraces the truth about our humanity. This responsibility extends to ourselves, our families and our communities and our expression of our love for each other through charity. There is no place for this teaching in Obamacare. Do we do it a disservice when we call it Obamacare, making it sound so partisan, when it really should be a step too far for anyone who isn’t a socialist? And I still assume, perhaps naively, most Americans are not socialists? But his hubris is misplaced. The machinery of the bureaucracy is churning madly to issue as many rules and regulations as possible this year to lock Obamacare in place and make it more and more difficult to repeal the socialistic law that deprives us of our liberty — a law that will turn us into subjects rather than citizens. Some on the “left” are taking this renewed focused on health-care policy to say, “We told you so,” a single-payer option would have been better. Why isn’t the single-payer option better? Obamacare will quickly take us to the single-payer health system that then-Senator Obama said he prefers. Private insurance companies are pulling out of states across the country, depriving people of the coverage they have and prefer. Health insurance agents are being forced to find other ways to make a living, as new regulations from Washington are strangling their businesses. Long-established Catholic hospitals, including chains in Pennsylvania and California, are being sold to for-profit, secular chains. And tens of millions of people who get good private health insurance through their jobs will soon be shoved into government-run health systems where the government will tell them what insurance and health services they can and cannot have. We are well on our way to President Obama’s single-payer health-care system that the American people so vociferously reject. If you could have 10 minutes with the Supreme Court, what would you urge justices to bear in mind before they rule on the case they are taking up regarding the health-care law? This is about so much more than health care. This is the battle for liberty of our time. Former Attorney General Ed Meese said recently that the court’s decision will be “the most important in 100 years.” Either we will turn one-sixth of our economy into a centralized system controlled by elite policymakers or we will return to freedom. The Commerce Clause of the Constitution has been stretched to limits unimagined by the Founding Fathers. This is the time for the court to say, “Stop!” The Constitution’s protection of our lives and liberty means what it says, and declaring the health law unconstitutional and stopping its limitless government control over our lives will begin to return our country to the path to liberty and prosperity. With its decision on Obamacare, the court will determine not only the future of health care in America, but whether or not we will live in a free country. How might you seek to persuade “social justice” advocates to reconsider the individual mandate and this whole top-down approach to reform? Is there common ground to be found? There are much better ways to get to the goal of health insurance for everyone than Obamacare. The health law will actually leave at least 23 million people without health insurance, and probably tens of millions more, and it will force nearly one in four Americans into the worst health-care program in the country: Medicaid. People will literally die waiting to see a physician. We can build in changes to our health-care system that are much more compatible with our overall economy and that would achieve its goals at a much lower cost, with much better quality of care. For example, we could rearrange the tax and other subsidies already in place to provide more help for those at the lower end of the income scale. They could choose the private insurance that works for them and their families. But if people don’t buy coverage, then the money could be used to automatically enroll them in a private plan that would cover their major medical bills. Properly structured incentives would be more effective than a mandate in expanding access to health insurance. And preserving freedom to choose policies in a competitive marketplace will assure that patients, not government, are at the center. I’ve been heartened to see Congressman Paul Ryan taking Catholic social teaching seriously when it comes to the budget and entitlement reform. There should be a similar engagement to health-care policy, shouldn’t there? Representative Ryan is indeed a powerful leader in helping people understand the moral imperative of entitlement reform. We have been working for years with faith-based groups who understand the importance of health-care freedom as a religious issue. This controversy over the Obamacare mandate has made it abundantly clear to them that this is a fundamentally important constitutional question. And thank heaven for Paul Ryan and his leadership. He not only understands the moral imperative for change, but he has the road map to get us back on the right path. Posted on the National Catholic Register, March 7, 2012.